Looking for mommy-daughter activities? Blogger found some in Avon & Danville, Ind. Recently, I decided to take my daughter to do something different from what we usually do on our “mommy-daughter” days. We hopped in the car and headed down U.S. 36 to start our adventure. I had been to the Mayberry Café, 78 W. Main St., in Danville, Ind., once before, but had not taken her there. So, we made it our first stop in Danville. Even though my 5-year-old has no idea who Andy Griffith is, I thought she would enjoy it. I was right. 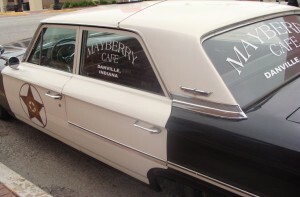 Before we went in, we checked out the 1962 Ford Galaxy that is a replica of the Mayberry squad car that Andy drove. Upon entering, you see a small gift shop with memorabilia from the 1960s television series. As we walked into the dining room, my daughter immediately noticed the televisions playing the Andy Griffith Show. The inside of the restaurant has a homey feel, and the food is what I call comfort food. Menu items include fried chicken, pasta dishes, sandwiches and more. The child’s plate was a great value. My daughter had a large serving of food, and she loved that she was given a token to trade in for a prize at the end of the meal. After lunch, we walked over to Mad Hatter Cups and Cakes, 57 S. Washington St., for dessert. 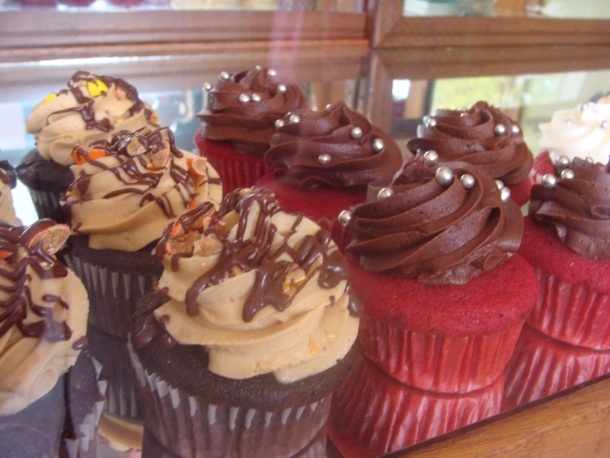 The shop is very small, but the cupcakes are delicious. The selection was limited that day to a few varieties of cupcakes. We shared a chocolate with chocolate icing. It was well worth the stop. After we left the bakery, we hit the road and headed back toward Avon. It was a beautiful day, and I knew my daughter needed to work off some of the sugar she had just had, so we stopped at the Washington Township Community Park, 115 S. County Road 575 East in Avon. 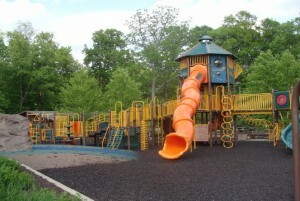 This park has one of our favorite playgrounds in the area and plenty of areas to walk or bike in the 73.5 acre park. In the summer, we love to go to the free splash pad. The park also has two shelter houses, 5 miles of hiking trails, amphitheater and volleyball and basketball courts. After playing and walking through the park, we had worked up an appetite again. So, we met my husband for dinner at Pizza King Station, 8100 U.S. 36 in Avon. My daughter loves the train that serves the drinks to each table. She also enjoys that each booth has its own television. I love the thin crust diced pepperoni pizza they serve. You can also get sandwiches, pastas and salads. We both enjoyed our day in Danville and Avon, and I highly recommend it to any parent for a fun, family getaway.